Ketut Madra has devoted his life to the study, preservation, and practice of Bali’s rich cultural arts. Primarily as a painter, but also as a dancer, musician, and community leader, Madra is steeped in the stories and legends at the center of the island’s culture and community. His unique ability to convey action and emotion in a rich and imaginative composition brings the traditional to life for modern audiences, Western and Balinese alike. Originally from Pengosekan, a small community near Ubud, Madra moved to nearby Peliatan as a young man in the late 1950s to work as a painter for the art dealer Wayan Gedah. At that time he also began studying with Tjokorda Oka Gambir, and learned the techniques and conventions of traditional wayang painting, including the specific colors, iconography, and costume for scores of characters. 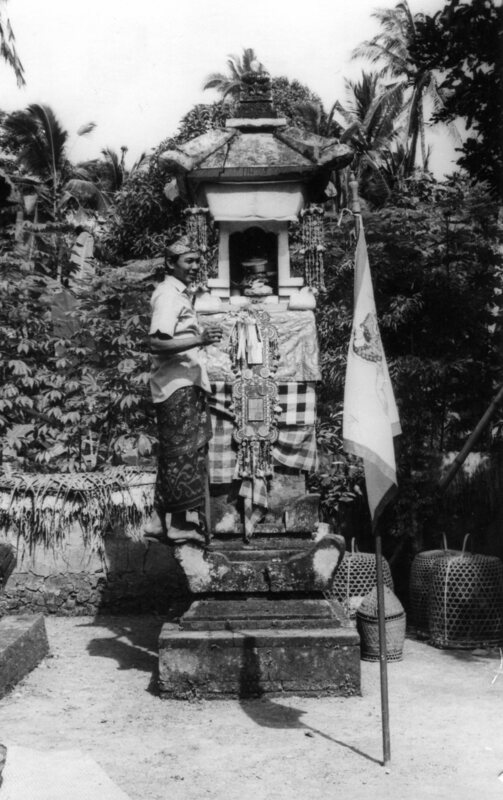 Madra in a 1973 ceremony in his family temple in Peliatan. 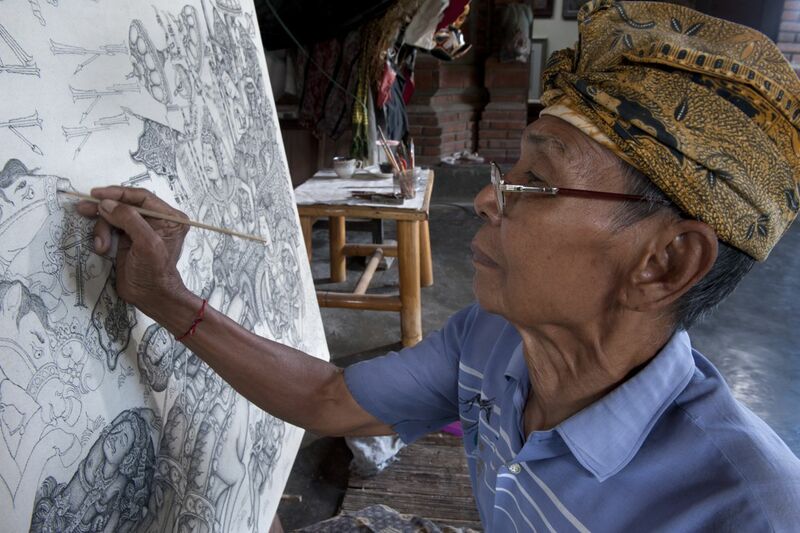 Madra started painting exclusively wayang narratives in the early 1960s, and soon developed a reputation as a skillful and original artist. He works with deliberation, and sells work directly from his studio to people who find him, usually through word-of-mouth. Occasionally, trusted local dealers with galleries catering to serious collectors also buy his work. In 1974, Madra’s work was shown in international exhibitions in the UK and the USA for the first time. In the same year he completed the first bungalow of what would become the Ketut Madra Homestay on his property in Peliatan. Over the next 15 years, he gradually expanded the accommodations for students, travelers, musicians, and artists interested in “a quiet place to learn about Bali.” The homestay has been a central feature in the life of Madra and his family, and has introduced three generations of visitors to his work and to traditional Balinese arts and culture. Madra contemplates his mask before performing topeng tua. At the age of 41, having focused up to that point on work and the homestay, Madra needed something more. Nyoman Kakul, a preeminent dancer of Batuan village who admired Madra’s understanding of the stories told in Balinese dance drama, urged him to learn to perform. More than 30 years later than most Balinese dancers take their first lessons, Madra learned the role of topeng keras, the rough prime minister in the king’s court. He continues to dance more than 30 years later, playing a variety of roles for which he is highly regarded. Madra also learned as an adult to play the rebab, the two-stringed bowed lute in the gamelan ensemble. He dances and plays regularly with the Tirta Sari gamelan group in Peliatan. Dance, Madra says, is a near perfect complement to his life as a painter. Performing in stories he had only watched and painted brings new insight to character and deeper understanding of the spiritual and devotional nature of both kinds of work. At home in June 2011, Ketut Madra with his wife Wayan Konderi and son Made Berata.